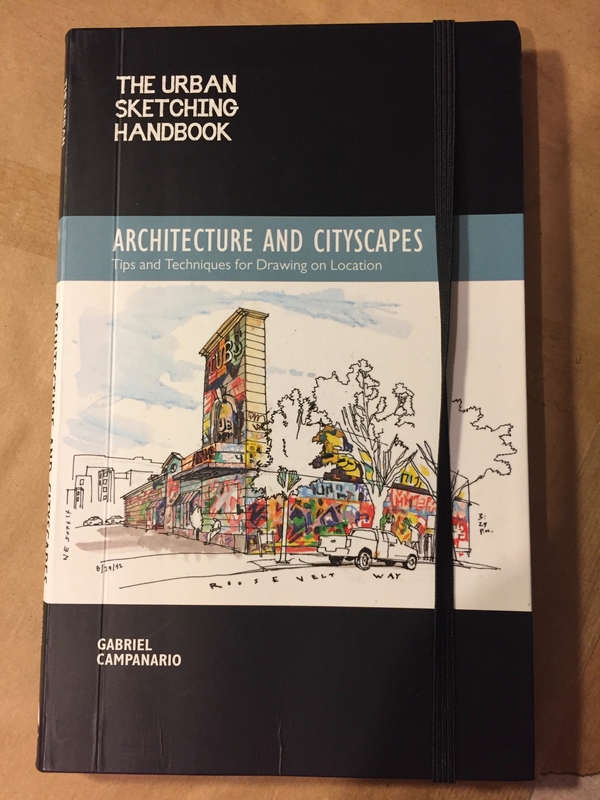 In 2016, one of my birthday presents was “The Urban Sketching Handbook” by Gabriel Camanario. This book gave me some discipline. It also made me realise that I could label what I was doing as ‘Urban Sketching’. From “just drawing things I see” I became an Urban Sketcher. This gave purpose and direction to the activity. It also proposed constraints. I am someone who finds constraints helpful. In my drawings I try to get at least some of those. The more of those I get, the more successful I feel. My subjects, in general, are the blocks of flats and urban developments in North London. I live in a tower block. From my window I can see many other towers. View from my window. You can see the air pollution or fog. See also the shadow of my tower on the fog. Until I started drawing, these were just anonymous monoliths. Now I can name a good many of them, and can appreciate their different characters. Because the reason I draw is not to produce a drawing. The reason I draw is to make me see. When I look carefully at a building to draw it, I appreciate the effort the architect has put in, and I witness the modifications and adjustments made by people who live there. These are people’s homes. I see the fancy finishing of the brickwork. I see how the architects of the 1950s and 60s strove to give people outside space: balconies, walkways. I see how some of these have worked and some haven’t. People put flower pots, washing lines, bicycles, satellite dishes. Strange and possibly illicit cables are sometimes draped across the brutalist façades. The building is used, and the human actions which mark it are part of the picture and important to see. I’m drawing a real building, not making an architectural plan. I like to get old and new in the same picture, and that is often possible. Tower blocks rise above Victorian terraces. Ancient walls surround modern infrastructure. Church spires are dwarfed by skyscrapers. If I can, I like to show this in the picture, as a reminder that our modern buildings likewise will be absorbed and surrounded by whatever comes next.